Denton citizens of all ages love music, so it’s not surprising that the community has embraced the New Horizons Band program. Every semester, music education students from the University of North Texas teach small group or large ensemble sectionals with the band in a mutually beneficial partnership. The 65 members of the Denton New Horizons Band range in age from 40 to 92, and are divided into two groups: one for beginners, and one for more experienced players. Members come from all walks of life, are both working and retired, and play the entire range of instruments one finds in a traditional concert wind ensemble. The Denton New Horizons Band’s free concerts draw crowds of 75 to 200 for each performance. It plays regularly for the Denton community at events such as the Denton Arts and Jazz Festival, and has even performed at the Texas Music Educators Association convention in San Antonio. Any given year might find the band playing at a local soup kitchen, accompanying a high school choir, or fund raising for local charity organizations. 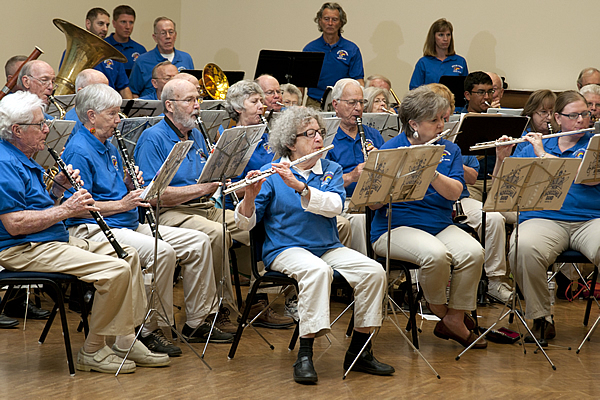 Learn more about the Denton Horizons Senior Band.